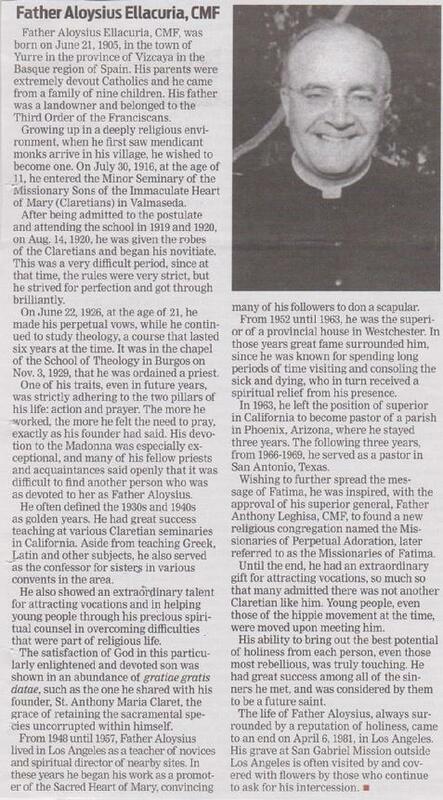 On Sept. 19, 2014, Dr. Andrea Ambrosi, approved by Archbishop José Gomez as postulator for the cause of beatification and canonization of the Servant of God, Father Aloysius Ellacuria, CMF (1905-1981), a Claretian priest who ministered in Southern California for may years, formally petitioned the archbishop to initiate the diocesan inquiry on his life, heroic virtues and reputation of holiness and of intercessory power. The norms issued by the Congregation for the Cause of Saints state that "once the petition has been accepted ... the bishop is to publicize the petition of the postulator in his own diocese ... and to invite all the faithful to bring to his attention any useful information which they might have to offer regarding the cause." (Normae servandae, n. 11b) Accordingly, The Tidings now publishes the petition in this cause, in a summarized form in its print edition and in its full form online, www.angelusnews.com. 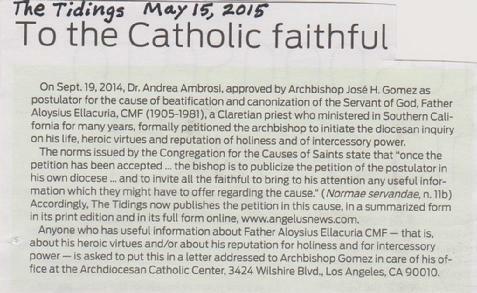 Anyone who has useful information about Father Aloysius Ellacuria, CMF - that is, about his heroic virtues and/or about his reputation for holiness and for intercessory power - is asked to put this in a letter addressed to Archbishop Gomez in care of his office at the Archdiocesean Catholic Center, 3424 Wilshire Blvd., Los Angeles, CA 90010. Father Aloysius Ellacuria, CMF, was born on June 21, 1905, in the town of Yurre in the province of Vizcaya in the Basque region of Spain. His parents were extremely devout Catholics and he came from a family of nine children. His father was a landowner and belonged to the Third Order of the Franciscans. Growning up in a deeply religious environment, when he first saw mendicant monks arrive in his village he wished to become one. On July 30, 1916, at the age of 11, he entered the Minor Seminary of the Missionary Sons of the Immaculate Heart of Mary (Claretians) in Valmaseda. After being admitted to the postulate and attending the school in 1919 and 1920, on Aug. 14, 1920, he was given the habit of the Claretians and began his novitiate. This was a very difficult period, since at that time, the rules were very strick, but he strived for perfection and got through brilliantly. In June 22, 1926, at the age of 21, he made his perpetual vows, while he continued to study theology, a course that lasted six years at the time. It was in the chapel of the School of Theology in Burgos on Nov. 3, 1929, that he was ordained a priest. One of his traits, even in future years, was strictly adhering to the two pillars of his life: action and prayer. The more he worked, the more he felt the need to pray, exactly as his founder had said. His devotion to Our Blessed Mother was especially exceptional, and many of the fellow priests and acquaintances said openly that it was difficult to find another person who was as devoted to her as Father Aloysius. He often described the 1930's and 1940's as gold years. He had great success teaching at various Claretian seminaries in Californa. Aside from teaching Greek, Latin and other subjects, he also served as the confessor for sisters in various convents in the area. He also showed an extraordinary talent for attracting vocations and in helping young people through his precious spiritual counsel in overcoming difficulties that were part of religious life. The satisfaction of God in this paritcularly enlighted and devoted son was shown in an abundance of gratiae gratis datae, which he shared with his founder, Saint Anthony Maria Claret, the grace of retaining within himself the sacramental species. From 1948 until 1957, Father Aloysius lived in Los Angeles as a teacher of novices and spiritual director of nearby sites. In these years he began his work as a promoter of the Immaculate Heart of Mary, convincing many of spiritual children to don the scapular. From 1952 until 1963, he was the superior of a provincial house on Westchester Place. In those years great fame surrounded him, since he was known for spending long periods of time visiting and consoling the sick and dying, who in turn received a spiritual relief from his presence. In 1963, he left the position of superior in California to become pastor of a parish in Phoenix, Arizona, where he stayed three years. The following three years, form 1966-1969, he served as a pastor in San Antonio, Texas. Wishing to further spread the message of Fatima, he was inspired, with the approval of his superior general, Father Anthony Leghisa, CMF, to found a new religious congregation named the Missionaries of Perpetual Adoration later referred to as the Missionaries of Fatima. Until the end, he had an extraordinary gift for attracting vocations, so much so that many admitted there was not another Claretian like him. Young people even those of the hippie movement at the time, were moved upon meeting him. His ability to bring out the best potential of holiness from each person, even those most rebellious, was truly touching. He had great success among all the sinners he met, and was considered by them to be a future saint. The life of Fr. Aloysius, always surrounded by a reputation of holiness, came to an end on April 6, 1981, in Los Angeles. His grave at San Gabriel Mission outside Los Angeles is often visited by and covered with flowers by those who continue to ask for his intercession. ROME—The U.S. Conference of Catholic Bishops (USCCB) will meet, November 16-19, in Baltimore for their annual Fall General Assembly. The bishops will hear addresses by Archbishop Joseph E. Kurtz of Louisville, Kentucky, USCCB president, and Archbishop Carlo Maria Viganó, apostolic nuncio to the United States. The bishops will discuss and vote on revisions to the proposed USCCB strategic priorities for USCCB's next planning cycle. The priorities, if approved, will inform the writing of the Conference's next strategic plan, which will cover 2017-2020. The bishops discussed and provided input on a draft version of these priorities at their Spring General Assembly in St. Louis. The bishops will also discuss and vote on a new introductory note and a limited revision to their quadrennial statement on political responsibility, "Forming Consciences for Faithful Citizenship." The revised statement, which is reissued the calendar year before a U.S. presidential election, will feature new language around issues of public concern for Catholics. The revisions are the result of a working group led by Cardinal Daniel N. DiNardo of Galveston-Houston, USCCB vice president. The bishops will vote for USCCB treasurer-elect and the chairmen-elect of five USCCB committees: Clergy, Consecrated Life and Vocations; Divine Worship; Domestic Justice and Human Development; Laity, Marriage, Family Life and Youth; and Migration. They will also elect the next general secretary, and episcopal board members of Catholic Relief Services (CRS) and the Catholic Legal Immigration Network, Inc. (CLINIC). The bishops will hear reports including one by the chairmen of collaborating committees on recommendations for the Jubilee of Mercy; an update by Bishop Frank J. Caggiano of Bridgeport, Connecticut, on World Youth Day 2016 in Krakow; and an update by Cardinal Séan P. O'Malley, OFM Cap., of Boston on diocesan Project Rachel Ministry on post-abortion healing. Archbishop Timothy P. Broglio of the Archdiocese for the Military Services will present on increasing the number of Catholic priests ministering to the Catholic faithful in the Armed Forces of the United States. There will also be a report and update by the Bishops' Working Group on the Life and Dignity of the Human Person on communications research and convocation planning. CRS chairman Archbishop Paul S. Coakley of Oklahoma City and CRS President Carolyn Woo will present on how CRS programming is responding to Laudato Sí, Pope Francis' encyclical on ecology. Archbishop William E. Lori of Baltimore, chairman of the Ad Hoc Committee on Religious Liberty, will introduce a trailer to a movie on Dignitatis Humanae, the Second Vatican Council's document on religious freedom. Bishop Richard J. Malone of Buffalo, New York, chairman of the Committee on Laity, Marriage, Family Life and Youth, will report on marriage and family life ministry. Dominican Sister Donna Markham, executive director of Catholic Charities USA, will also make a presentation. The bishops will participate in the canonical consultation of three causes for canonization: Rev. Aloysius Ellacuria, CMF, Sister Ida Peterfy, SDSH, and Antonia Cuipa and 81 companions. This is a step in the Catholic Church's process toward declaring a person a saint. The agenda also includes a report by the Subcommittee on the Church in Latin America on the 50th anniversary of the Collection for the Church in Latin America; a report from the National Advisory Council; discussion and vote of the 2016 Conference budget; and discussion and vote of the 2017 diocesan assessment.